Green Turf | Chester County — Thompsons Landscaping Inc.
"For years we have been mowing lawns while other companies applied lawn treatments. They based their applications off a predetermined schedule with the goal of performing each service based on speed, rather than quality. We educated ourselves on fertilization and weed control, and formed Green Turf, the lawn treatment division of Thompson's Landscaping." We adjust deck height depending on temperature and season. Our blades are constantly sharpened. We have the ability and know how to evaluate, locate, and address problem areas before they worsen. Continually changing mowing pattern to prevent tire ruts and scalping. We use a premium turf type grass for golf courses and sports fields that provides an excellent dark green color. The seed we use is from a newer strand of fescues that are more disease-resistant and drought-tolerant than those previously grown. Aeration in the fall encourages stronger turf grass roots and the added turf density helps choke out weeds in the lawn. Aeration provides reduced water runoff and improves soil water uptake. The combination of over-seeding and aerating in the fall encourages aggressive root growth of new and existing grass plants. Early Spring: Pre-emergent Weed Control - In early spring your lawn enters its growth cycle after being dormant during the winter. We begin by applying a pre-emergent crabgrass control to prevent weeds before they root and a fertilizer to provide nutrients to the lawn that promotes faster green-up. Late Spring: Pre-emergent Weed Control & Fertilizer - As temperatures warm up, broadleaf weeds begin to germinate and establish themselves in the lawn. Once this process begins, we focus on eliminating dandelion, chickweed and white clover. Emphasis is placed on treating the borders of the lawn where weeds creep in from outside. This application provides a great mix of nutrients to promote strong growth and overall good health for your lawn. Early Summer: Fertilizer & Broadleaf Weed Control - During this period your lawn redirects its energy and focuses on developing leaf growth. We apply a fertilizer modified to support your lawn's changing needs while iron is added to strengthen the root system adn allow the plant to retain its leaf color longer. Surface insects such as Sod Webworm, Cinch Bug and Bill Bug eat the leaf blades at this time, therefore we apply an insecticide as well. Late Summer: Fertilizer & Broadleaf Weed Control - This time of year you will notice an increase in the density of your lawn's turf. 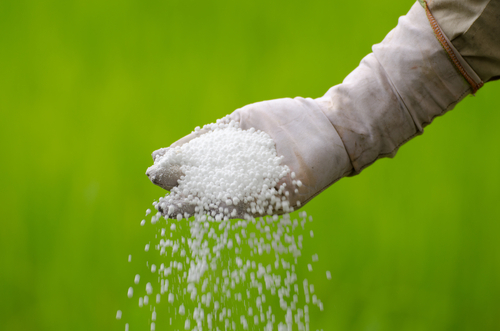 We apply a balanced fertilizer to stimulate and strengthen the grass while focusing our efforts on your lawn's root system by applying a slow release fertilizer tha thelps defend against periods of drought. Early Fall: Fertilizer & Broadleaf Weed Control - As fall arrives your lawn needs help recovering from the summer stress of extreme heat, drought and burn. We apply a fertilizer to help boost the plant's strength and combat weeds. This is also an excellent time to control hot weather weeds that may have germinated over the summer. We will also apply a liquid weed control to eradicate weeds from your lawn. Late Fall: Winterizing Fertilizer - As the amount of daylight decreases and temperatures begin to cool, your lawn's growth begins to slow and starts to lose its color. The plant continues to grow downward and expand its root system in anticipation of the colder weather. We apply a high rate of nitrogen to the lawn that enhances root development, provides food reserves for winter, and promotes earlier green-up next spring. Soil testing is the process of analyzing the nutrients present in a soil sample to determine the type and amount of fertilizer needed. Periodic soil testing provides homeowners with the vital information needed to maintain a healthy lawn or garden. We use these soil tests in order to determine which nutrients the soil needs, what type of fertilizer to use, how much fertilizer to use, and how often to fertilize. Lawns just will not grow properly if the soil is not in proper balance. In fact, most people only look at the grass, and not the foundation soil beneath. No lawn treatment will work well if the soil balance is off. That is where lime comes in, to reduce the acidity levels of your soil. Applications of lime on existing lawns are best applied in Fall and Spring because of cooler temperatures and readily available moisture.